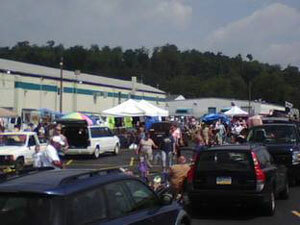 • Flea Market personnel will park outside vendors into empty spaces. Inside vendor spaces will be assigned by the Flea Market Manager. Electricity is available for vendor displays for an additional fee. Please contact the Flea Market manager for specific details. • Only Flea Market personnel shall assign spaces. This means you cannot "resell" or "save" any spaces. Please stay in your assigned areas. • If canceling, please notify the Flea Market manager at 724-736-4445 ext. 400 as soon as possible during the week with the exception of Friday. • For your convenience, there is a security guard on duty from 5:00 p.m. on Saturday till 8:00 a.m. on Sunday. • No pets of any kind, excluding certified service animals. • No alcoholic beverages to be consumed on premises. • Your vehicle must fit in the rented outdoor space. • All vendors must vacate market grounds by closing each day. • Sale or swap of explosives, firearms, ammunition, flammables, or tactical knives. • Sale or swap of alcoholic beverages. • Sale or swap of obscene or pornographic material. • Sale or swap of any live animals. • Sale or swap of all tabacco products. • Vendors may not deface or nail anything to the tables, poles, or pavement. • Vendors may not remove, rearrange or move any tables the market has provided. • All tables and field spaces are on a first come first serve basis unless marked "reserved". • Vendors are responsible for PA sales tax. • Each seller is required to keep his or her area clean and keep their items within their designated space and out of walkways and driveways. Sufficient access must be made available for emergency vehicles and personnel. • No one is permitted to leave any discarded merchandise, boxes, or cartons on the grounds. • All items and vehicles must be removed from the market each day. • The Perryopolis Flea Market is not responsible for any lost, stolen or misplaced items and vendors are solely responsible for securing all their property. • Management reserves the right to refuse or reject any vendor or customer solely at its discretion. • Any vendor who wishes to sell food or beverages of any kind must obtain prior approval by the Flea Market manager. Additionally, all vendors selling food or beverages are required to obtain the proper licensure from the Pennsylvania Department of Agriculture. • Vendors should be on the premises by 6:00a.m. Sunday for an orderly entrance to the respected areas. • The above rules and regulations are subject to change at the discretion of Perryopolis Flea Market management at any time.